Coconut Grove is one of the oldest and loveliest cities in all of Miami-Dade county. Coconut Grove neighborhoods are distinguished by their lush tropical landscapes, with large, beautiful banyan trees and expansive foliage decorating the streets. 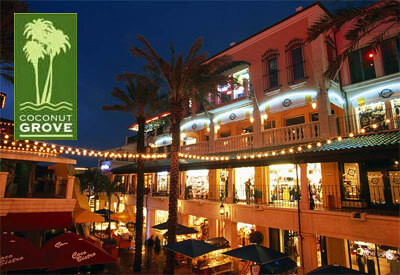 If the high end Miami lifestyle is your idea of paradise, consider the Grove the place for you! The Grove is a lively, bohemian city with an abundance in art, dining, and entertainment options, not to mention a strong, bustling economy. Coral Grove is technically a neighborhood, and is frequently rated as one of the best neighborhoods to live in Miami. Housing communities in the Grove are predominantly waterfront properties, which provide spectacular views as well as easy access to Miami's intercoastal waterways. Planning to move to Coconut Grove but not sure where to start? The most popular communities in the grove include the following: The Moorings, Cloisters, Governor House, Grove Isle, Treasure Trove, The Anchorage. Coconut Grove locals moving to or from Florida? Moving On Up™ has got you covered. We are proud members of the American Moving and Storage Association (AMSA). Our moving company performs same-day local moves for relocation anywhere within a 250 miles radius of Greater Miami. Call us now at 1-800-945-9569 to speak to a moving consultant for more information. Plan your South Florida regional relocation by visiting our Local Moves and moving promotions pages. Visit Miami's online Web Portal for Miami-Dade County. This community site contains useful details regarding the South Florida lifestyle, Dade county public transportation, local business resources, and neighborhood information. These moving tools should greatly help in planning your move to beautiful, sunny Miami Beach. Moving On Up™ is conveniently located in Hollywood and able to help you with any moving needs. Give us a call at (954) 924-1522 to schedule an in-home estimate or book your move. Request a moving quote and get a FREE in-home visual estimate for an accurate, binding price.